The climate denial clown car careens onward. In breathless, puffed-up prose, the bizarro-sphere was buzzing last night about a “game changing” passage in a draft IPCC document, posted online by a self promoting would-be “mole” in the IPCC review process. A new IPCC report is due next fall. Look for more attempts to muddy and confuse the public about it. The reality-based community is, this time, prepared. Alec Rawls runs a blog called “stopgreensuicide” and he registered himself as an “expert reviewer” for WG1. As I’ve pointed out in the case of climate science mangler Lord Christopher Monckton, practically anyone can register for these positions using an online form. Nobody appoints “expert reviewers”, even though Lord Monckton likes to make out that he was “appointed”. The IPCC considers its draft reports, prior to acceptance, to be pre-decisional, provided in confidence to reviewers, and not for public distribution, quotation or citation. Each page of the drafts are also marked with the words “Do not cite, quote or distribute”. This did not deter Mr Rawls from discussing the first draft of the report on climate change sceptic blog Watts Up With That. Like everyone else who participated in this review, I agreed not to cite, quote or distribute the draft. The IPCC also made a further request, which reviewers were not required to agree to, that we “not discuss the contents of the FOD (First Order Draft) in public fora such as blogs. Well Mr Rawls’ itchy blogging finger has got the better of him. He decided to upload the entire second draft of the AR5 WG1 report and popped it on his blog, which as I write is now down, most likely due to the traffic from other bloggers, including New York Times’ Andy Revkin, The Daily Telegraph’s James Delingpole, and Watts Up With That. What this is actually talking about, is a fringe theory that cosmic rays have an important influence on the climate. What neither Mr Rawls, Watts Up With That or the climate sceptic blogger James Delingpole did, was to point out that the paragraphs on the chapter which follow the one which Rawls quotes, go on to explain why these theories were not robust. The single sentence that this guy pulls out is simply paraphrasing an argument that has been put forward by a few controversial papers (note the crucial word “seems”) purporting significant cosmic-ray influences on climate. Its existence in the draft is proof that we considered all peer-reviewed literature, including potentially important papers that deviate from the herd. The rest of the paragraph from which he has lifted this sentence, however, goes on to show that subsequent peer-reviewed literature has discredited the assumptions and/or methodology of those papers, and failed to find any effect. The absence of evidence for significant cosmic-ray effects is clearly stated in the executive summary. This guy’s spin is truly bizarre. Anyone who would buy the idea that this is a “game changer” is obviously not really looking at what is there. Skeptical Science has also looked at Rawls’ cherry-picking and offers a more detailed summary of the “cosmic ray” theory. If the IPCC were to report that the sun is a significant player in the current rapid global warming, that would indeed be major news, because the body of peer-reviewed scientific literature and data clearly show that the sun has made little if any contribution to the observed global warming over the past 50+ years (Figure 1). Figure 1: Percent contributions of greenhouse gases (GHGs), sulfur dioxide (SO2), the sun, volcanoes, and El Niño Southern Oscillation (ENSO) to the observed global surface warming over the past 50-65 years according to Tett et al. 2000 (T00, dark blue), Meehl et al. 2004 (M04, red), Stone et al. 2007 (S07, green), Lean and Rind 2008 (LR08, purple), Huber and Knutti 2011 (HK11, light blue), Gillett et al. 2012 (G12, orange), and Wigley and Santer 2012 (WS12, dark green). So why would the latest IPCC report contradict these studies when its purpose is to summarize the latest and greatest scientific research? The answer is simple — it doesn’t. Rawls has completely misrepresented the IPCC report. This statement refers to a hypothesis of Henrik Svensmark from the Danish National Space Institute, who has proposed that galactic cosmic rays (GCRs) could exert significant influence over global temperatures. The GCR hypothesis suggests that when they reach Earth, GCRs (high-energy charged particles originating from somewhere in our galaxy) are capable of “seeding” clouds; thus at times when a lot of GCRs are reaching the Earth’s surface, more clouds will form. Clouds generally have a cooling effect on the Earth’s temperature, because they reflect sunlight. So the hypothesis goes like this: high solar activity means a strong solar magnetic field, which deflects more GCRs away from Earth, which means less cloud formation, which means less sunlight is reflected away from Earth, which means more warming. This GCR-caused warming would amplify the warming already being caused by increased solar activity. Conversely, cooling from decreased solar activity would hypothetically be amplified by more GCRs on Earth, more clouds, more reflected sunlight, and thus more cooling. But more importantly in this context, even if GCRs did influence global temperature, they would currently be having a cooling effect. The term “radiative forcing” refers to a global energy imbalance on Earth, which may be caused by various effects like changes in the greenhouse effect or solar activity. A positive forcing will result in warming temperatures, while a negative forcing will result in cooling. Here the IPCC is saying that since 1980, the sun and volcanoes have combined to cause a slightly negative global energy imbalance, which means they have had a slight cooling influence on global temperatures over the past three decades. Indeed, solar activity has decreased a bit over that timeframe (Figure 2). 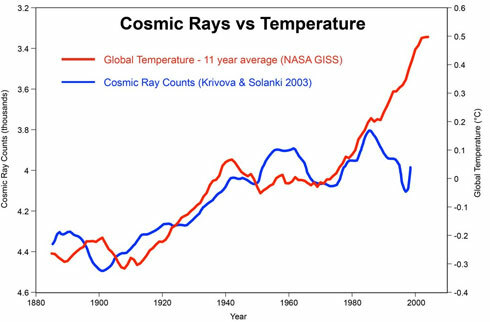 Figure 2: Global temperature (red, NASA GISS) and Total solar irradiance (blue, 1880 to 1978 from Solanki, 1979 to 2009 from PMOD), with 11-year running averages. As we would expect, lower solar activity including a weaker solar magnetic field has translated into a slight increase in GCR flux on Earth (Figure 3). Note that on the left-hand axis of Figure 3, GCR counts decrease going up the axis in order to show the relationship with temperature, since fewer GCRs hypothetically means fewer clouds, less reflected sunlight, and higher temperatures. So, if GCRs really do amplify the solar influence on global temperatures, since 1980 they are amplifying a cooling effect. 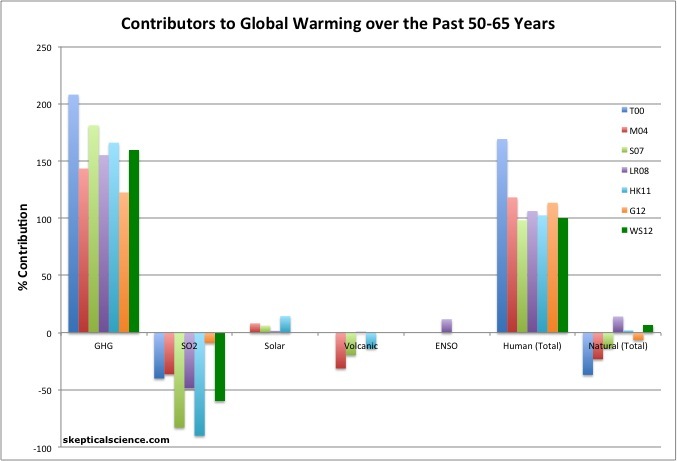 Rawls has argued to the contrary by claiming that the climate is still responding to the increase in solar activity from the early 20th century, and that GCRs are amplifying that solar warming from over 60 years ago. This argument is simply physically wrong. As Figure 2 illustrates, when solar activity rises, temperatures follow suit very soon thereafter. In fact, during the mid-20th century, solar activity and global surface temperatures both flattened out. Are we to believe that the planet suddenly began responding to the pre-1950 solar activity increase in 1975—2012, after not warming 1940—1975? The argument makes no physical sense. On top of that, the hypothetical GCR process is a relatively rapid one. 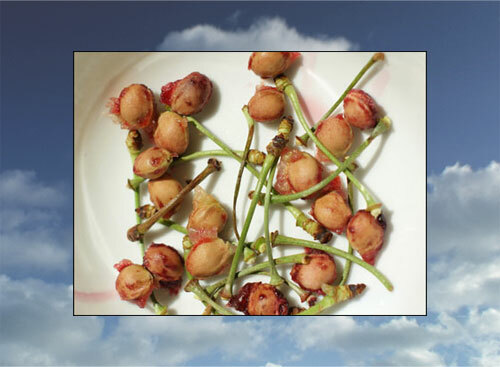 Cloud formation from GCR seeding should occur within days, and clouds have very short lifetimes. For GCRs to have a warming effect, solar activity must be increasing right now. It is not, in fact solar activity has been essentially flat and slightly declining in recent decades. Changes in solar activity from 60+ years ago have no bearing whatsoever on GCRs today. The leaked IPCC report states that there may be some connection between GCRs and some aspects of the climate system. However, the report is also consistent with the body of scientific literature in stating that research indicates GCRs are not effective at seeding clouds and have very little influence on global temperatures. Solar activity has been nearly flat and slightly decreasing in recent decades, meaning that if GCRs do amplify solar influences on climate, they are amplifying a cooling effect. The body of peer-reviewed scientific literature is very clear: human greenhouse gas emissions, not solar activity or galactic cosmic rays, are causing global warming. The leaked IPCC report is entirely consistent with this conclusion. In fact, in attempting to argue to the contrary, Rawls has scored an own goal by showing that if anything, GCRs are currently amplifying a solar cooling effect.